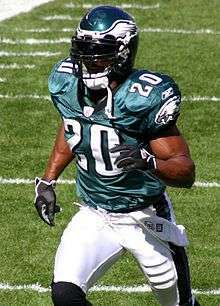 This is a complete list of American football players who have played for the Philadelphia Eagles of the National Football League (NFL). It includes players that have played at least one game in the NFL regular season. The Philadelphia Eagles franchise was originally founded in 1933. The Eagles have played for six NFL Championships and have won three, but still have no Super Bowl wins out of two appearances. "Philadelphia Eagles' All-time Roster (players A-B)". Philadelphia Eagles. Retrieved 2011-06-18. "Philadelphia Eagles' All-time Roster (players B-C)". Philadelphia Eagles. Retrieved 2011-06-18. "Philadelphia Eagles' All-time Roster (players C-D)". Philadelphia Eagles. Retrieved 2011-06-18. 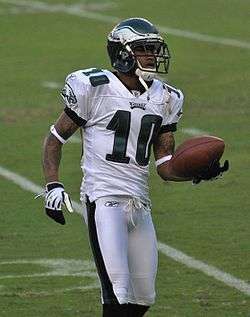 "Philadelphia Eagles' All-time Roster (players D-G)". 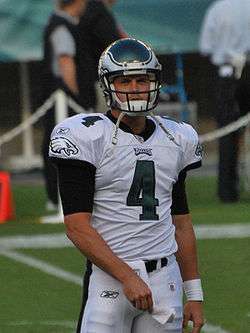 Philadelphia Eagles. Retrieved 2011-06-18. "Philadelphia Eagles' All-time Roster (players G-H)". Philadelphia Eagles. Retrieved 2011-06-18. "Philadelphia Eagles' All-time Roster (players H-J)". Philadelphia Eagles. Retrieved 2011-06-18. "Philadelphia Eagles' All-time Roster (players J-L)". Philadelphia Eagles. Retrieved 2011-06-18. "Philadelphia Eagles' All-time Roster (players L-M)". Philadelphia Eagles. Retrieved 2011-06-18. "Philadelphia Eagles' All-time Roster (players M-O)". Philadelphia Eagles. Retrieved 2011-06-18. "Philadelphia Eagles' All-time Roster (players O-R)". Philadelphia Eagles. Retrieved 2011-06-18. "Philadelphia Eagles' All-time Roster (players R-S)". Philadelphia Eagles. Retrieved 2011-06-18. "Philadelphia Eagles' All-time Roster (players S-T)". Philadelphia Eagles. Retrieved 2011-06-18. "Philadelphia Eagles' All-time Roster (players T-W)". Philadelphia Eagles. Retrieved 2011-06-18. "Philadelphia Eagles' All-time Roster (players W-Z)". Philadelphia Eagles. Retrieved 2011-06-18.